BellowsTech valve seals, manufactured using bellows technology, can eliminate O-rings to increase compatibility and reduce potential leak paths. Bellows technology creates a uniform outside wall for consistent movement under hydraulic pressure. Various stroke lengths and sizes are offered, and can be manufactured with O-ring grooves, flanges, and carbon-face seals to make the best possible connection to customer assemblies. BellowsTech valve seals are 100% visually inspected throughout the manufacturing process and confirmed with mass spectrometer testing. Click here to view our nearly 100 standard diaphragm sizes online, which is also available as a downloadable PDF file. Visit the BellowsTech online store today! Could tiny airplanes be hurricane hunters? The compact LR 17 is a mere 17 mm in diameter and has stall torque of 30 mNm, which is high compared to its small size. Because of the self-locking feature of the friction drive, the motor can hold position without consuming any power. The integrated 15-bit magnetic absolute encoder gives a closed loop resolution of 0.2 milli-radians (0.01 deg). A frequency selective surface that acts as an RF filter and helps reduce the radar cross-section of antennas consists of a pattern of geometrical objects. There are literally thousands of possibilities, and testing each one physically would take enormous amounts of time. With simulation, though, we can find promising candidates in just minutes. 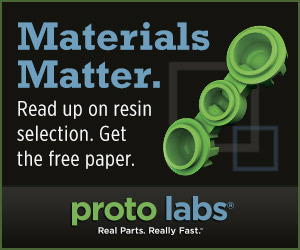 Learn about the performance parameters of different thermoplastic materials and selecting the best resin for your application by clicking above. Companies interested in testing the latest in low-cost carbon fiber have a new opportunity to partner with the Department of Energy's Carbon Fiber Technology Facility in Oak Ridge, Tenn.
MIT researchers are aiming to produce the thinnest and most lightweight solar panels possible using atom-thick photovoltaic sheets that pack hundreds of times more power per weight than conventional solar cells. British additive manufacturing specialist Renishaw is contributing its machine and materials knowledge to create key prototype parts for the U.K.'s BLOODHOUND supersonic car, which will attempt to break the 1,000-mph speed barrier during the summer of 2015. American Sales Development (ASD) offers cool new bolt-on adjustable lift systems for easily turning existing tables, desks, workstations, assembly tables, countertops, or any work surface into an ergonomically height-adjustable unit. Built-in height adjustability is a desirable option offered by most workbench and workstation manufacturers, but these units can cost thousands of dollars. 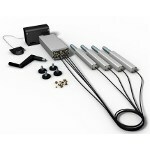 ASD QS systems consist of four height-adjusting legs, a pump, and either motor or hand-crank actuation. 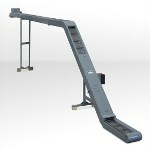 Typical sit and stand height range is 12 in., but the QS systems also offer travel distances of 8 and 16 in. for special situations. Each system arrives in one box completely assembled with drilling templates, ready to attach and operate. Systems are available from stock to four weeks, and prices range from $433 to $690. Differential pressure transmitters are reliable, cost-effective instruments to measure the hydrostatic level of a liquid in a vented or sealed tank. Learn more about them from American Sensor Technologies. Balluff's new full line of miniature sensors can be used in the smallest of installation spaces and easily integrated into existing mechatronic assemblies. 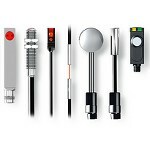 Balluff mini sensors are available with all operating principles: inductive, photoelectric, magnetic, capacitive, or ultrasonic sensors. Compact inductive couplers, space-saving I/O modules, and RFID-in-miniature versions are available for each sensor technology. These sensors are ideally suited for factory automation -- especially robotics, handling, and production lines. The lineup includes the shortest inductive M12 sensor in the world (12 mm). Apple Rubber Products now offers two new silicone compounds with UL 50 and UL 50E certifications for use with and without environmental considerations. UL 50 and UL 50E are the safety standards for seal use with enclosures for electrical equipment, and Apple Rubber has selected two silicone compounds, 14SL7ML and 35SL5ML, to provide to customers who require products with these certifications. These compounds provide an ultra-low compression set, even at elevated temperatures, and offer the quality and durability customers need for safe operations. 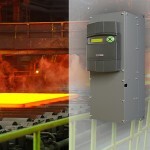 With its recently extended PLX range, Sprint Electric offers the latest in regenerative three-phase digital DC drive technology. The DC drives are able to regenerate energy back to the mains supply under braking without the need for expensive, complex intermediate storage, resistive dumping, or additional power bridges. PLX DC drives are compact, powerful, flexible, and easy to program, and are available in current ratings between 12 A and 2,250 A at supply voltages up to 690 VAC. A four-quadrant DC drive uses two thyristor bridges to enable it to motor and brake in both directions of rotation. This allows it to reverse the torque to slow the load very gently or almost instantaneously, regenerating energy at the same time. And unlike an AC drive, it is able to generate full torque at zero speed, enabling the load to be held stationary in complete safety without the need for mechanical brakes, an especially useful feature for winders and hoists. Three-time Boeing Performance Excellence Award Winner American Aerospace Controls has released a new four-page, full-color capabilities brochure, highlighting the company's full range of standard and custom electrical transducers for high-reliability defense, aerospace, spacecraft, automotive, light rapid transit (LRT), rail, helicopter, rotorcraft, and industrial requirements. Precious metal-clad wire that offers superior formability, ductility, solderability, and design flexibility to plated wire is available from Anomet Products. These gold or silver composite wires are metallurgically bonded to a core material such as copper, Kovar, nickel-iron, molybdenum, stainless steel, tantalum, and titanium. 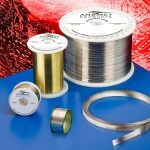 They are less expensive than solid wire and allow designers to combine properties such as strength and conductivity. Applications include a wide range of electronic connectors and medical devices. Whether the application involves producing/removing chips or moving parts/scrap pieces, Hennig can provide the chip conveyor for all machine tool requirements. The company's new 2.5-in.-pitch steel belt can be made for most applications in the field when the standard 1.5-in.-pitch belt is not effective for the particular conditions present. Conveyors can be manufactured in widths from 4 in. to 80 in., depending on the need. The unique Hennig belt hinge is designed as one continuous piece, whereas many competitive brands do not have this feature. All belt manufacturing is done on Hennig's in-house press equipment. Portable electric generators retrofitted with off-the-shelf hardware by University of Alabama (UA) researchers emitted significantly lower levels of carbon monoxide (CO) exhaust, according to the results of tests conducted recently by the National Institute of Standards and Technology (NIST) for the U.S. Consumer Product Safety Commission (CPSC). Could tiny, smart airplanes be the next hurricane hunters? Researcher Kamran Mohseni envisions a day when the carbon-fiber unmanned vehicles in his laboratory at the University of Florida will swarm over, under, and through hurricanes to help predict the strength and path of the storms. His team is developing and building the prototypes now. The 2014 Subaru Forester is the first vehicle to ace every aspect of the challenging small overlap front crash test conducted by the Insurance Institute for Highway Safety (IIHS). The Forester, the only one of 13 small SUVs to earn an overall rating of good in the test, and the 2013 Mitsubishi Outlander Sport, which earns acceptable, are the latest vehicles to qualify for the Institute's recently inaugurated top honor, TOP SAFETY PICK+. Each of the other 11 SUVs earns either a poor or marginal rating. Honda engineer Shubho Bhattacharya was inspired to develop technology to reduce the energy needed to operate the auto-body painting system at Honda's manufacturing plant in Marysville, Ohio. 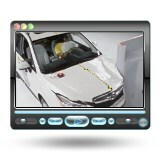 Auto-body painting accounts for the most energy use in Honda's production process. With the help of his fellow associates, Bhattacharya conceived Honda's Intelligent Paint Technology, which has cut Honda's North American manufacturing CO2 emissions by about 10,000 metric tons per year and saves a considerable amount of energy daily.